Spring was a very, VERY, long time in coming to Minnesota this year. It was cold and snowy all through April and winter said a final good-bye by dumping over a foot of snow on us in early May. Yuck. 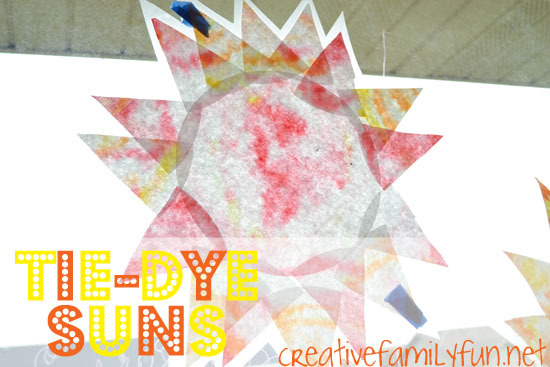 So in order to celebrate the arrival of warm and sunny weather, we made these fun tie-dye suns. 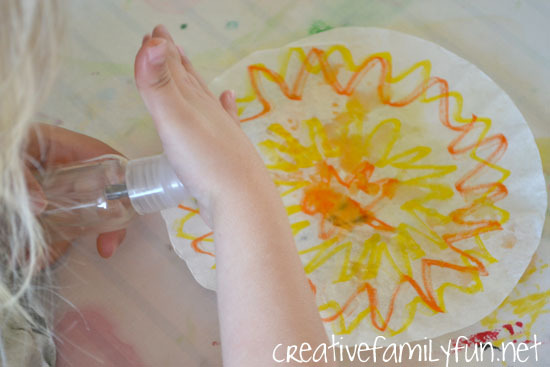 For the first step, make fun swirly designs on your coffee filters with your markers. You’ll need about three coffee filters for each sun. 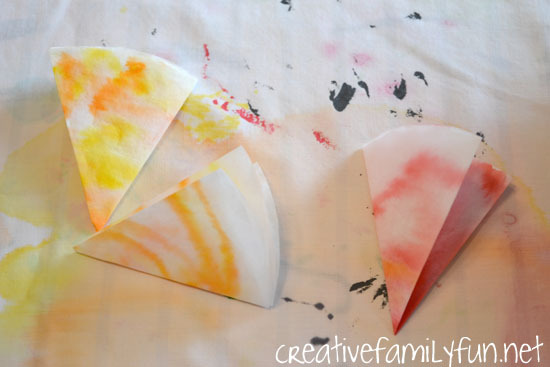 You don’t want to color in the entire coffee filter. 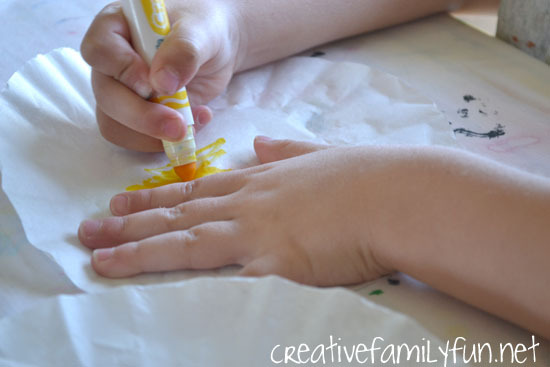 Instead draw swirls, zigzags, or other fun designs. 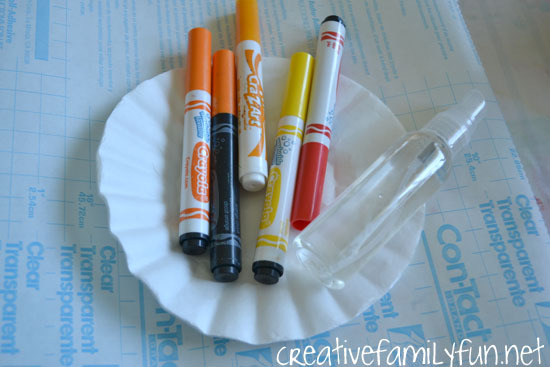 Once you are pleased with your designs, spray your decorated coffee filters with water. Get them completely wet, but don’t over-saturate them. Now, watch your colors spread out . When we had wet our filters we were pleasantly surprised to see the tie-dye affect. After your coffee filter have dried, fold two of them in half and then half again. Keep folding until you have a pie-shaped wedge. Unfold, then cut along your creases. You will have eight wedges per filter. Make sure you keep one whole for the center of your sun. Cut a piece of contact paper large enough for your suns. 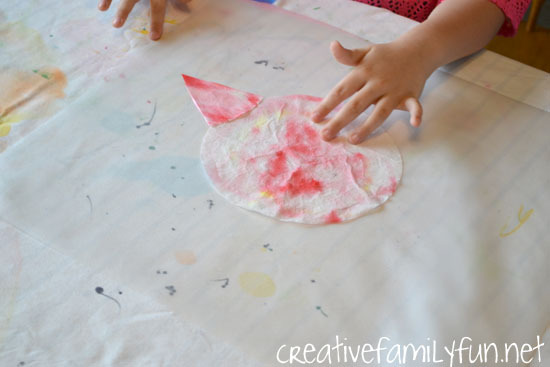 Tape the contact paper to your table sticky side up and lay your coffee filter and wedges down to form a sun and its rays. 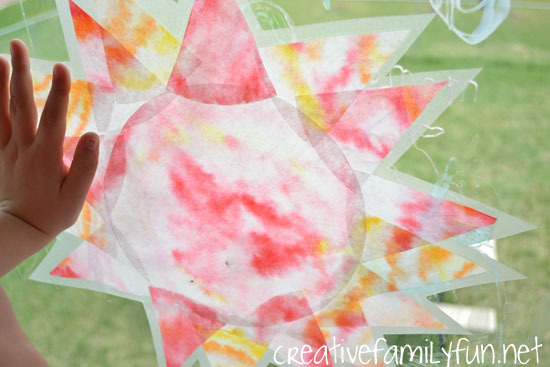 Seal your sun with another piece of contact paper cut to the same size. Cut around your sun, but make sure you leave a sealed edge. Now you have a beautiful sun to say hello to spring! P.S. Please ignore the dirty windows. The girls have been drawing with window markers almost every day lately!